Male or female; dress in black trousers, bowtie and white tuxedo jacket and go to Duke's to drink the best Martini you'll ever taste. About: Dukes Hotel Bar, famous for its Martinis, is a comfortable and relaxing place to enjoy a choice of cocktails, champagne, Pimms or the wide selection of cognacs collected by the hotel, some of which are over 150 years old. Guests can also have a tab added to their room bill during their stay. If you haven’t heard of the Dukes Hotel Bar then you’ll surely have heard the phrase. ‘Shaken, not stirred.’ Well, this is the place that inspired James Bond’s creator Ian Fleming to coin the line. 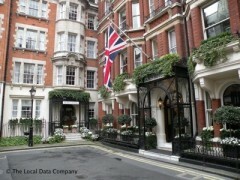 Dukes Hotel is located in Mayfair and the venue is internationally renowned for its martinis. Why would you go anywhere else? The story goes that Ian Fleming was a regular at Duke’s and it was the hotel bar’s Martinis that inspired Mr. Bond’s signature drink. You’ll find Duke’s Bar in the eponymous Duke’s Hotel on the edge of Green Park. Dress up and enjoy the history and romance of one of London’s most special bars. Famed for its martinis, legend has it this is where Ian Fleming came up with James Bond’s memorable ‘shaken, not stirred’ line. There’s a separate bar in the adjoining garden where you can indulge in cognac and cigars. "As close to the perfect Martini as you're ever going to get..."